Welcome to the Open science café! We all come from different countries and different backgrounds, so the purpose of the workshop is to share experiences, expertises, best practices, questions and possibile solutions on the common framework of Open Science. We shall divide into six groups leaded by international experts on: Open Science as a global issue, new tools for Open Science, new infrastructures (like the European Open Science Cloud), ideas for the “next generation” repositories, data management and reuse practices, text and data mining and copyright issues. After 20 minutes participants will be invited to mix and change group, to better debate and compare different approaches. Don’t forget to bring your passion for openness and your wish to change things! This tutorial will detail two approaches for making repository materials, and metadata pertaining to them, machine discoverable: ResourceSync and Signposting. Both are closely aligned with the REST and HATEOAS architectural principles of the Web. Accessibility and reusability of research data is as important for academic communication as accessibility and reusability of publications. In many cases research data are part of a publication and new genre data-publication is rapidly expanding. With a growing focus on research data come demands for an increase investment in data curation and corresponding infrastructure. In order to make best use of these investments and to build sound research data policies the corresponding legal issues have to be addressed. IP-law is an important sphere of the legal environment of research data. Workshop participants will be introduced to applicable IP-law. They will learn what needs to be investigated in order to determine who "owns", respectively who has the right to control certain research data. This will enhance the ability of the participants to advise researchers especially in planning research project and writing research data management plans. No prior knowledge is copyright is needed to successfully participate in the workshop. However, participants should be aware that the workshop does not constitute legal advice and that due to variations in the applicable law the specific questions referring to the law of a particular country may not be answered. A name plus an ORCID iD equals an unambiguous connection between a person and their work. More than 3 million researchers think that this is a good thing - that’s why they registered for their iD. But some iDs are better than others… Some iDs are helpful sources of additional information, like: when was this connection made? Who made it? Where did the information attached come from? Some iDs are just a number. Some iDs are a real connection. How can you tell the difference, and, most importantly, how can you make sure that the iDs in your system are good ones? This workshop look at how you can use authentication, API connections and new tools from ORCID to collect authenticated, trustworthy iDs, and finally we'll cover how to use and share authenticated ORCID iDs once you have them. This tutorial covers some of the key components that's involved in authoring articles, annotations, and notifications in a decentralised manner. The intention of this tutorial is to give hands on experience for researchers and annotators/reviewers, as well as librarians in how they can control their own Web profiles and data. During the tutorial, participants will create their own WebIDs, personal storage spaces, interact, and social engage with documents in a number of different ways. A common view on the aspects of Open Science that are most important and useful to pursue and support (and how these hang together) currently seems lacking, and active uptake of Open Science practices by researchers is limited so far. With the combined knowledge and brainpower of all the participants in this active session (call it a ‘doathon’) we will gauge the Open Science waters to see if we can suggest routes that will convince the ‘early majority’ of researchers to embark. To do that we will look at open science practices in all phases of the workflow and determine to what extent these are already adopted organically, to what extent they are technically feasible (using existing tools and platforms) and to what extent they align with important declarations & policies. The end result will be practical open science workflow(s) that have a good chance of wide adoption and thus merit full support of the OA and OS community. This could provide direction and prioritise next steps for all those involved (researchers, funders, publishers, librarians, and technologists). This talk will describe the socio-technical problem space which makes it challenging to create a native Web-based scholarly communication. Topics such as accessibility, centralisation, communication, user experience, machine-readability, and community practice will be discussed in order to investigate the necessity to materialise solutions towards decentralised scholarly communication. WebIDs, personal storages, Linked Data Notifications, Web annotations, as well as the Linked Research initiative will be discussed. dokieli (a clientside editor for decentralised article publishing, annotations and social interactions) will be used to exemplify what is already possible today and the challenges ahead. To be truly useful, Open Data must be more than a file deposited in a public repository. The recently published FAIR Principles for scholarly data - Findability, Accessibility, Interoperabiliy, and Reusability - provide guideposts toward an emergent scholarly publication landscape where data, and its provenance, are transparently available for evaluation and reuse by both humans and machines. However, the FAIR Principles (purposely) do not advocate a technical implementation, preferring to simply describe the behaviors and qualities expected from contemporary data publications that allow them to fully participate in the Internet of Open Data and Services. As such, several key stakeholders involved in the establishment of the FAIR Principles felt it would be useful to create an exemplar implementation, to answer the question "what does FAIR look like, in practice?" In solving this problem, the stakeholder group committed itself to the use of existing Web technologies and standards, and in particular, refused to consider creating any new API. The outcome was a novel combination of emergent Web technologies and standards that can be applied, incrementally and in myriad combinations, to gradually increase the FAIRness of both legacy and prospective data publications. In this presentation, I will provide a walk-through of the design and application of this novel approach. We will explore how even simple enhancements to a data publication, applicable to any repository, dramatically increases its FAIRness. We will then examine the upper end of FAIRness, where data can be discovered and dynamically "projected" into a variety of formats, according to the user's needs, without any human intervention. W3C's data strategist, Phil Archer, is calling for a revolution. Not a political one, and certainly not a violent one, but a revolution nonetheless. A revolution in the way people think about the way data is shared on the Web, whether openly or not; an end to using the Web to do no more than transfer data from A to B in a way that could be just as easily achieved by putting it on a USB stick and sending it through the post. The Web is so much more than that. To quote from the Architecture of the World Wide Web, it’s: “… a remarkable information space of interrelated resources, growing across languages, cultures, and media.” It’s the connectivity of ideas and facts between people who are unknown to each other that is so exciting and that has such profound implications. That's what the Data on the Web Best Practices and its associated W3C standards are about as Phil Archer will explain. In my talk I will provide an overview of the ongoing European debate on copyright and education, with a focus on the educational exception. I will present an approach that places educational goals first, and copyright policy only as a secondary, instrumental factor. I will give arguments for a strong educational exception and an open norm, as necessary to support modern education. I will also present an approach that sees copyright reform and voluntary open licensing (of educational resources, but also research content and data) as complimentary approaches that secure basic freedoms and support innovation and modernisation across the fields of education and research. Such an approach is the basis of policy work that we have been conducting as Communia, the European association on the Digital Public Domain. Based on this approach, we have been conducting a range of research projects that provide much needed evidence for the ongoing policy process - I will present our research on educational practices and a legal study that proposed a “barometer” for measuring the strength of educational exceptions across Europe. Chris will expand on her Insights article where she discusses the broad and complex funder open access (OA) policy environment in the UK and describes some of the challenges and opportunities libraries face in providing frictionless services to support academics in Open Access publishing. She offers a view on the actions of publishers in this policy environment, as well as outlining how strategic discussions have moved beyond the library to include the whole institution. She will then go on to work being led by Imperial College London to bring the Harvard OA Policy to the UK and will offer some insights as to how such an approach might be taken forward across Europe. This talk introduces economic aspects to scholarly communications. Many of them come from my first-hand experience or thought over the years. I also want to set the scene to understand the scope of the issues for the discussants. Dr. Shulenburger will examine how scholarly communications got to its current dysfunctional state and chart the course toward an affordable and accessible future. Some tactics may well lead to worsening the scholarly communications system; his remarks will focus on identifying dysfunctional tactics while encouraging persistence in those that will lead to improvement. Dr. MacKie-Mason will discuss the underlying economics of the scholarly publishing industry. He will then focus on the implications for different pathways to achieve open access, and to reduce publisher monopoly power, de-constructing some of the myths common in current conversations about these issues. Unlike studies on the impact of Open Access on citations or library budgets, the number of studies on OA's impact on society is relatively very small. Arguments about the societal benefits of OA are very common in OA mandates and policies as well as in advocacy materials, though with little evidence to back them up. This session aims to give an overview of 30+ research papers and reports that tried to investigate this issue using different approaches and research methods. With insight from these studies, a framework was developed to classify the different types of impact OA can have on society. This framework also aims to provide guidance for future research efforts in this direction. While it can be argued that once universal OA is achieved (for academia) it will be open to the rest of society, knowledge of who the beneficiaries are is still important. It will help in identifying target groups for more efficient advocacy and inform the ongoing debate on who should bear the cost of transition. As an international health consortium, COMDIS-HSD works with a combination of researchers in developing country NGOs, researchers at the University of Leeds, media outlets, independent researchers and consultants. This pool of expertise has highlighted issues about the open access privileges afforded to academic institutions versus the access that is available for those based outside of academia. Despite efforts by Research4Life to enable developing country actors to access research findings, many sections of society remain on the outside of the access paywall due to their non-academic status and/or their lack of funding. In this presentation, I share some challenges faced by our consortium in ensuring our research findings are accessible to all sections of society within the countries in which we work. It draws on discussions with journalists in Nepal to highlight the need for citizens to access and interpret the research that is primarily for and about them. In this presentation I discuss a recent piece of research I conducted on the geography of so-called 'megaregions' in the United States. In collaboration with my colleague Garrett Nelson at Dartmouth College (US), I used a large dataset and cloud computing to algorithmically define commuter megaregions in the United States. The paper was published in PLOS ONE in November 30 2016 and since then has racked up more than 200,000 views. The associated data has also accumulated more than 40,000 views and 6,000 downloads on Figshare. But the reaction beyond this has been extremely exciting and demonstrates the value, reach and sometimes unexpected impacts of open access publishing. My presentation includes lots of maps and emphasises the benefits of speaking beyond the 'echo chambers' of our own academic disciplines. This session explores some of the issues raised by social media for open research, looking at such topics as: Extracting open data from closed systems; preservation and replication of studies based on dynamic data sets; the use of social media as a tool for opening up science; the ethical implications of research using social media data; social media data infiltrating research evaluation and analysis (altmetrics etc.) and the implications for researcher behaviour. Social media data provide online spaces where people can share their thoughts, opinions and feelings on almost any aspect of life. They may also act as important communication tools in disaster situations to be utilised by the public, and emergency services. However, there are a number of ethical issues around the openness of social media data, and how much of social media data can be accessed by commercial entities as well as academic researchers. The talk will discuss the issues around the openness of social media data, its persistence, and outline some of the fascinating work developed from this data. What ethical challenges does the pervasive use of social media platforms for personal and public communication in many societies pose for researchers? How do the challenges of doing research 'in' a social-media platform overlap with those posed by research 'on' social media platforms? Focusing on case studies drawn from the study of social movements in online environments, I will argue that a critical awareness of the architecture and political economy of social media platforms and their relationship with other forms of mass media is crucial to ethical research practice both when using social media data for research and when researching the use of social media to communicate. The ‘explosion’ of tracking tools that have accompanied the surge of web based information instruments has also open the possibility of measuring how new research publications are ‘read’, tweeted, shared, commented, discussed, rated, liked, etc. in an online, open and dynamic environment. All these online events leave ‘traces’ around the access, appraisal and use of scientific publications, thus allowing for the calculation of new metrics, which has given birth to the term ‘altmetrics’. These new metrics are expected to work as evidence of impact that can inform research evaluation and strategic decisions in science policy. However their actual meaning, validity and usefulness are still open questions. A review of the most important empirical research around altmetrics will be presented and hints on how these new metrics could be considered for practical purposes will be discussed with the audience. For the scholarly community, taking advantage of open access to take back ownership and management of scholarly communications is a work in progress since Stevan Harnad´s Subversive Proposal back in 1994 calling on all authors to archive their articles for free for everyone online. Repositories have achieved collaborative ways of providing visibility and open access to all kinds of contents, not only peer-reviewed journal articles, in support of research, education, open science and information needs of diverse audiences. This presentation will describe characteristics and achievements of the world landscape of repositories (institutional,subject,data,theses,journals repositories) and of repository networks. Then this presentation will share, from a developing region perspective, three of the challenges repositories face to help build a global inclusive and distributed ecosystem of repositories managed by the scholarly community: 1) open access policies that give primacy to repositories; 2) development of repository indicators in support of the evaluation process, and 3) processes to document, within the lifecycle of research, the existence and type of quality assessment of each research output so this data is available when repositories metadata are produced. One of the key aims of the COAR NGR group is to help us to overcome the challenges that still make it difficult to move beyond repositories as document silos. The group wants to see a globally interoperable network of repositories and global services built on top of repositories fulfilling the expectations of users in the 21st century. During this talk, I will address several use cases the COAR NGR working group aims to enable in the next generation of repositories. They include more effective techniques for metadata and content discovery & synchronization, enabling social notification feeds (including commenting and peer-review), supporting data mining, enabling recommender systems and offering new ways for comparing usage of content across repositories. 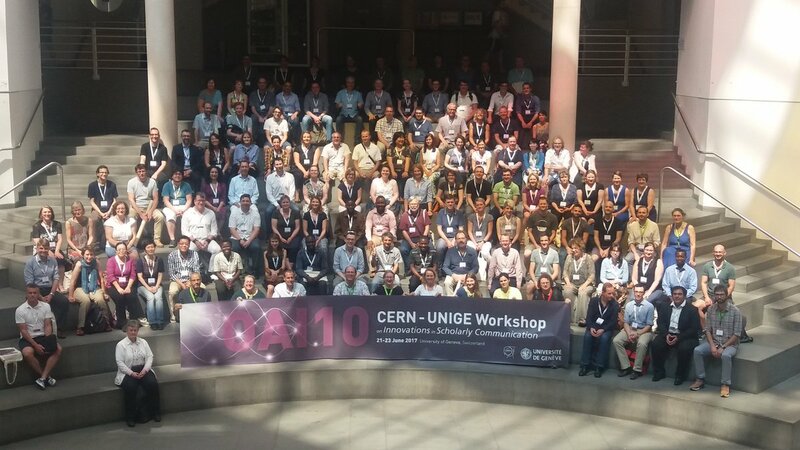 CERN will offer a guided tour for the first 48 participants who register. The tour will be free of charge.